You can find different varieties of chutney recipes here. Heat oil in a pan and once it is heated up add dhania, garlic, red chilies, jeera seeds and fry till it turns into golden brown and keep aside. In a same pan add mint leaves and fry till it turns into mushy and cool them. Grind all the items by adding water, salt and make a fine paste. Finally add tamarind (not water- full tamarind) and grind it well, till it turns into chutney form. 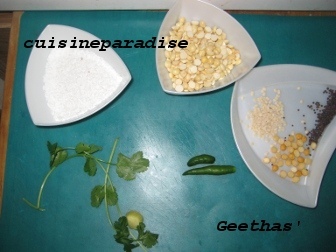 Note:- If you need you can do seasoning: heat oil in a pan and add mustard seeds, channa dal, urad dal, curry leaves and allow them to splutter and pour these mixtures into the chutney. 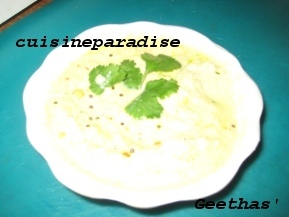 Here is the recipe for the basic coconut chutney. Grind all the ingredients and add water if necessary. Once it is done, pour oil in a pan and add the channa dal, urad dal and mustard seeds. Allow the mustard seeds to splutter and add curry leaf. Then add this seasoning to the grounded mixture and mix well.